Toaster Music, a musical and curatorial duo, is partnering with the Bixby Knolls Business Improvement Association to celebrate Women’s History Month. From 6:30PM to 9:30PM on March 2, as part of the monthly First Fridays Long Beach Art Walk, Toaster Music is presenting two solo art exhibitions inside the Expo Arts Center. 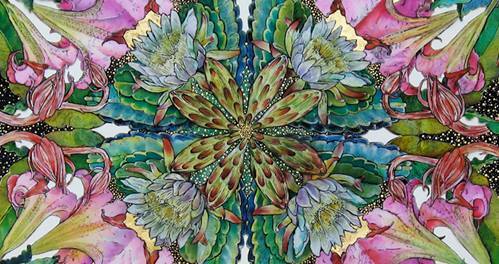 In the North Gallery, the watercolors, batiks and prints of Dorte Christjansen will be featured. Christjansen’s work often features highly detailed and carefully arranged images of flowers into vibrant, complex and visually stunning mandalas. She has a BA and MA in art from Cal State Long Beach and is a long time Long Beach resident. Her work is considered to be highly collectible. In the South Gallery, a monumental new work titled Aphrodite by Alex Diffin and Eric Michael will be on display. Nearly 7′ tall and 21′ wide, this multi-panel acrylic painting is a meditation on femininity, gender identity, and body obsession. The work was first shown at an exhibition titled She Is Worth It at Hermosa Design. Diffin is best known for her striking portraits of women, made with a mix of spray paint and brush techniques. Her work has been featured in group and solo shows throughout Southern California, and will be joining the Toaster Music curatorial team in April. Also in the North Gallery, Toaster Music will perform three sets of improvised electronic music in collaboration with the dancers of Maha and Company. Special guest Christa Galactica will be present to conduct a blessing and cleansing ritual. Toaster Music is Sumako and Sander Roscoe Wolff. They’ve worked tirelessly to activate disused retail spaces with music and art, create opportunities for local artists and musicians to share their work, and to enliven and engage the community with unique creative and cultural events.